In order to find the Lift Chair best suited for you, refer to the definitions below explaining the different options available. 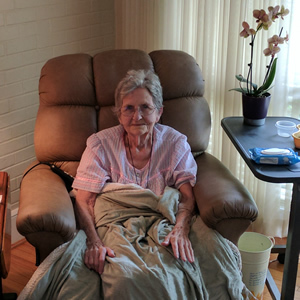 A 2-Position Lift Chair is perfect for performing many relaxing activities including reading, watching TV, working on your tablet, or for conversation with friends and family! A 3-Position Lift Chair puts you in a position ideal for napping or relaxing, in addition to the positions offered by a 2-Position Chair. Infinite Position chairs enable the backrest and footrest to move independently from one another so that a variety of positions can be reached. Zero Gravity and Trendelenburg positions are possible with an Infinite Position Chair. The Trendelenburg Position elevates one's feet higher than his or her head for increased comfort and relaxation. This position can help reduce swelling in the legs, improves circulation, and is available on the majority of our Infinite-Position Lift Chairs. The Zero Gravity Position can be reached on all Infinite-Position Lift Chairs. It positions one's thighs and lower legs higher than his or her torso, relieving pressure points on the body. NEW Sleep'N LIft Chairs are extra cozy lift chairs that help you sleep better and longer through the night. Infinite positions allow you to adjust for easier breathing, reduction of pressure points, better circulation and less leg issues that interrupt deep sleep. I was diagnosed with stage 4 bone cancer in January this year and have been housebound every sense. As time has progressed I have grown weaker and find everyday tasks becoming more difficult to manage. Fortunately a month before my diagnosis, my son had purchased a powerlift chair from Southern Mobility & Medical because I am 84 years old and had difficulty getting up from a sitting position. I call my chair my little miracle because it came to me at the perfect time and it helps me greatly in getting up and down. Since my cancer has made it painful to lay in bed, I have been sleeping in my chair because I can easily change the position to sleep mode. I tell everyone that it is more comfortable than my bed. Because I can use a remote to change the many different positions of the chair, it helps me stay comfortable all day and night. Thanks to the fine folks at Southern Mobility & Medical, I can stay in my own home and get around without assistance.